Vitamin C, also known as ascorbic acid, is a member of the water-soluble family of vitamins. It's required for normal growth and maintenance of most of the tissues of your body, including collagen, which is needed for healthy connective tissue and wound healing. Vitamin C also helps your bones and teeth stay strong. It's also necessary to make certain neurotransmitters and for protein metabolism. Your immune system relies on vitamin C for healthy function too. Plus there's a bonus for vegetarians. Eating foods rich in vitamin C will help your body absorb more iron from plant sources such as spinach, nuts, and seeds. The National Academies of Sciences, Engineering, and Medicine, Health and Medicine Division has determined the dietary reference intakes (DRI) for vitamin C. It's based on the daily nutritional needs of an average healthy person. If you have any medical issues, you should speak with your health care provider about your vitamin C requirements. Vitamin C is found naturally in fruits and vegetables, especially citrus fruits, strawberries, peppers, tomatoes, broccoli, and potatoes. People who don't eat enough fruits and vegetables are at risk of developing a deficiency. A long-standing Vitamin C deficiency can result in scurvy, a serious illness characterized by anemia, skin hemorrhages (blood spots) and gingivitis (gum disease). It's not common, but it can occur in people who are malnourished or alcoholics. Habitually eating a diet of highly processed foods with an insufficient amount of fruits and vegetables may result in a vitamin C deficiency. Since vitamin C is water-soluble, your body doesn't store it well, so it needs to be replenished daily. Scurvy may need to be treated with high doses of supplements, but a milder deficiency may be corrected by increasing consumption of fruits and vegetables that are high in vitamin C, especially citrus fruits, strawberries, potatoes, broccoli, tomatoes, and peppers. Vitamin C is diminished when fresh fruits and vegetables are exposed to air or heat, so fresh/raw fruits and vegetables have more vitamin C than those that are cooked or canned. Vitamin C is an antioxidant, and it's been recommended as a supplement for relief of colds and flu and as an alternative treatment for some forms of cancer. However, research hasn't provided sufficient evidence for these recommendations. 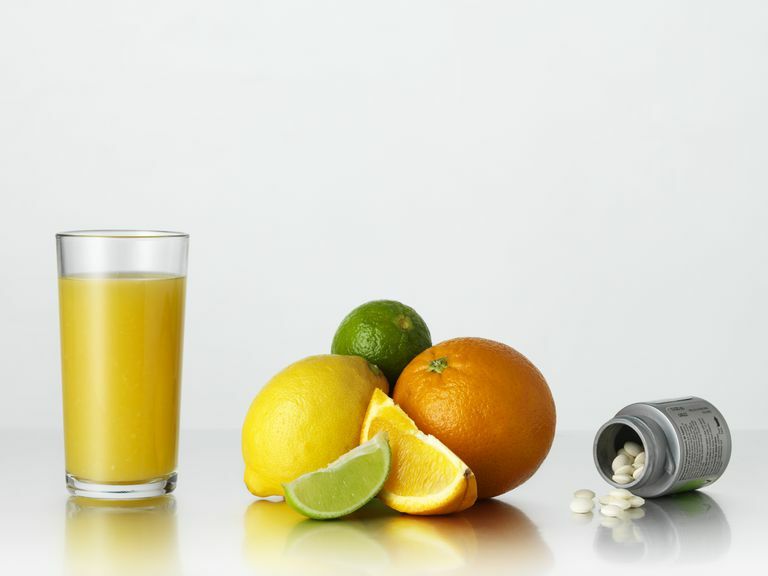 Although some studies have indicated that people with some types of cancer have lower blood levels of vitamin C than the general public, there's no evidence that taking vitamin C supplements reduces your risk of cancer. You can probably skip the supplemental form -- you're better off eating more fruits and vegetables -- they're rich in vitamin C, and they have other beneficial compounds you won't find in a typical dietary supplement. But, if you really think you need the supplements, avoid megadosing vitamin C. Taking large amounts of supplemental vitamin C may result in diarrhea or loose stools. The Institute of Medicine established 1,800 to 2,000 milligrams per day as the upper tolerable intake level. MedlinePlus.com. "Scurvy." Accessed March 19, 2016. https://www.nlm.nih.gov/medlineplus/ency/article/000355.htm. The National Academies of Sciences, Engineering and Medicine, Health and Medicine Division. "Dietary Reference Intakes Tables and Application." Accessed March 19, 2016. http://www.nationalacademies.org/hmd/Activities/Nutrition/SummaryDRIs/DRI-Tables.aspx. National Institutes of Health, Office of Dietary Supplements. "Vitamin C Fact Sheet for Health Professionals." Accessed March 19, 2016. https://ods.od.nih.gov/factsheets/VitaminC-HealthProfessional/.